It all began with a bottle of wine. Well, actually, with a couple of beers (but it will end with a bottle of wine). Erin and I were fairly new friends and had gone to Tuesday movie night at the local theater. ($2 candy, popcorn, or soda!). I had decided I officially really like this girl for two reasons: (1) she unabashedly cried during the movie (Me, Earl, and the Dying Girl), and (2) when we walked past the local pub on our way home and I asked her if she wanted to grab a beer she said quite enthusiastically, "absolutely", and backtracked immediately to get there. After two beers and another few blocks of walking she mentioned she was running a half marathon in a few months. At that point, I couldn't run 3 miles without serious discomfort, so naturally I said I was on board. In the months that followed we did many, many runs together in preparation for this race. As our training sessions grew longer and longer we would often start the run with a topic that we could discuss for awhile, just to pass the time. So, one day, Erin proposed we talk about "dream vacations." I told her about my dream of attending a cooking school in Medoc, France, taught by the gorgeous Mimi Thorisson (www.mimithorisson.com). ** To be clear, this is Mimi Thorisson, not me, Sydney. Although I hold out a secret hope that all women look like this in Medoc, and therefore so will I once I arrive there. I sent Erin a link to the school later that day with the title "for dreaming." She wrote me back, "let's go next Summer." I wrote back, "hahaha, good one." I soon realized she wasn't kidding. I wrote anguished e-mails "I can't go, this is crazy." But, the more we talked, the more I realized it wasn't crazy at all. It was a really good idea, and I wasn't going to get the chance to do this again. Once we booked out 4-day workshop in Medoc, France (and congratulated ourselves on picking awesome husbands who would approve of such a trip), Erin and I began to prepare for the trip. Did we begin to take French lessons? No. Did we peruse old French cookbooks to familiarize ourselves with the local cuisine? No. 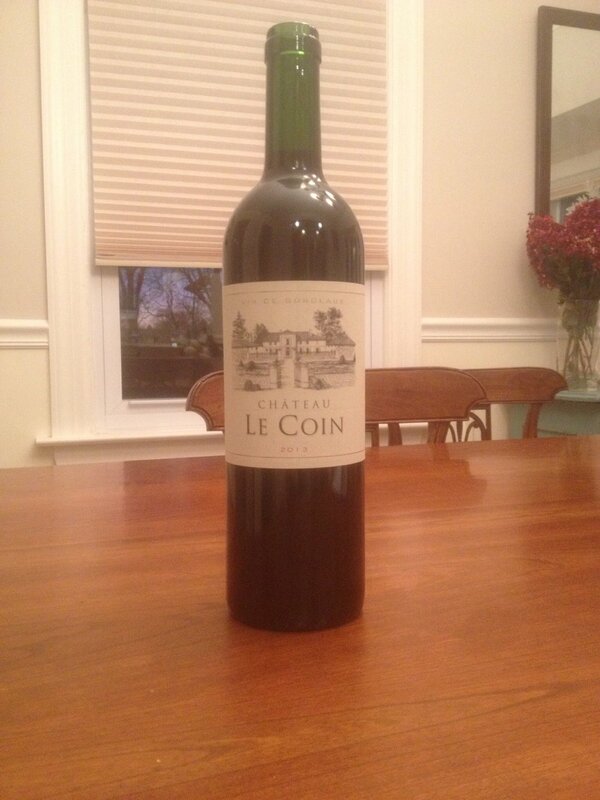 We decided we needed to start drinking as much wine from the Medoc region as possible. And so we have. So, this is the first in a series of posts about the wine we drank, and the things we discussed. So, we drank this bottle sitting at my kitchen table while the kids ran amuck and her son, Thomas, tried once again, to steal the tin of cookies from my bottom pantry shelf. We discussed the Showtime series "The Affair" and said that although we had previously discussed sympathizing with the main character before (on one of our long runs), we no longer felt anything for him. He is a bad person. Period. We still love the show. Erin seemed a bit fidgety and I asked her why. It seemed odd as I was preparing for a big party at my place and felt pretty relaxed. She said she couldn't help it, "you still have lots to do." I laughed and realized she wasn't comfortable because I hadn't laid out all my platters and bowls and put little pieces of paper in them with name of whatever food item I planned to place inside. So I did it. And made fun of her. And realized it made things so much easier. And the wine...delicious. As has every bottle from Medoc we have tried since. We are in for a really good time! Cook, Eat and Drink with Us!